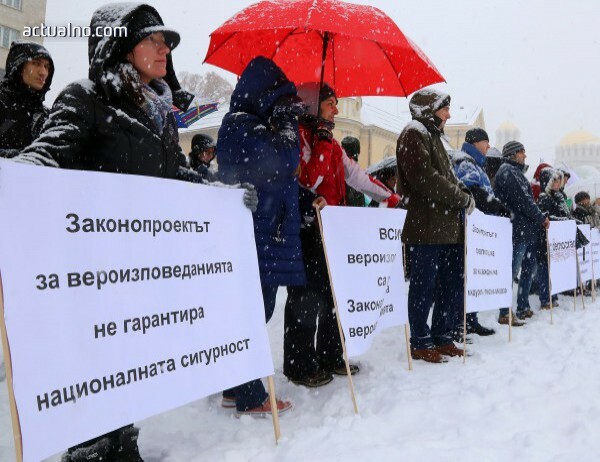 Protest of evangelical Christians in late December 2018 against the restrictive proposal for changes in the nation’s religious law. The sign reads: The Law on Religions Does Not Guarantee National Security (Photo courtesy of the website: actualno.com). It is also problematic that the state mandates as to how priests and clergy should legitimize themselves in order to represent the respective religious denominations they serve. The “representative power” is a part of the internal organization of religions and cannot be governed by the State under the European Convention on Human Rights and the Guidelines for the Adoption of Religious Legislation adopted by the Venice Commission and the Office for Democracy and Human Rights at the OSCE. There is another purely communist-Nazi style approach to control and discriminate against foreign clergymen. This is the requirement to notify the state if a non-Bulgarian clergy member participates in a worship service. Foreign clergymen can participate in the worship service “after the Directorate on Religions has been notified. When “participation” means to be “present during worship,” then only the mere presence of an individual is sufficient to apply this administrative burdensome requirement. Registered religious denominations will first have to notify the state and then admit the foreign clergyman to the worship service. If there is no such notification, in order to comply with this law, the foreign clergyman must listen to the worship service outside of the building where it is held. Such provisions establish unlawful discrimination on multiple grounds and are adopted in violation of the Protection against Discrimination Act (religion and national origin). The administrative burden for religious denominations has increased giving religious denominations only seven days after their registration to file the decision for registration by the court with the Directorate on Religions. In an age of “e-government”, the seeming inability for communication between the Sofia City Court and the Council of Ministers to provide this information as a part of the internal information exchange between government bodies is only an excuse for further harassment of the religious communities that register as religious denominations. Under a typical state-political model, so-called “big denominations” will receive a subsidy by the state. But funding seems to be the smallest problem of all the adopted changes – although it is absurd for taxpayers to be charged a tax to fund religious beliefs that they do not share (as is the practice with political parties).